Having seen all sorts of makeshift fixes – from post-it notes to bandages to condom wrappers – used to block wireless access point LEDs from beaming and sometimes blinking, some IT shops have begun turning off the lights altogether even though it can make their jobs a little tougher. Lively discussion broke out online this week among a forum of university IT pros after one member inquired about this “first-world problem,” as he contemplates whether to disable LEDs on APs across the board in an effort to improve dorm residents’ quality of life (i.e., help them grab more shuteye by reducing in-room light pollution). More than a dozen peers replied that they have indeed turned off the lights, some doing so in a wholesale manner, others taking it case by case. They say technicians can re-enable LEDs temporarily if need be for troubleshooting. Wireless APs obviously have become more ubiquitous, and increasingly are being moved out of hallways and into spaces such as dorm rooms, hospital rooms and offices. "Hallways are generally a poor choice because you really need the APs closest to clients, and walls provide separation that helps with [radio resource management] and such," says Lee Badman, the network architect within Information Technology Services at Syracuse University who sparked the original conversation online among his peers. One result of Wi-Fi users being in closer quarters with APs, though, is that many have taken it upon themselves to make the devices glow a little less brightly even as the users benefit from the improved wireless coverage. Some users don't want a beacon shining in their eyes as they try to get to sleep, others worry about the health effects of a blue light glowing all night, and still others fear overexposure to radio waves. Some even resort to unplugging the gear when they're not using it. These DIY fixes are not nearly as problematic as, say, rogue IT installations that can introduce security holes and interfere with network performance. But the downside of people covering up LEDs on access points for IT is that if someone calls to report a wireless issue, they can no longer pass along info about the lights on the AP until they remove whatever they used to cover them up. Some devices feature multiple lights, while others have a single light that changes colors to convey information. 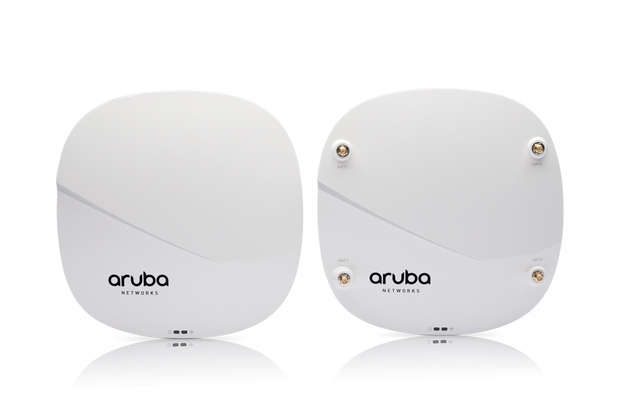 Have 320 series access points from Aruba Networks brightened your day or night? Network pros say they have begun asking vendors such as Cisco if they can provide an easier way to dim, rather than turn off the lights on the APs entirely, via wireless controllers. And some would like to see more granular control, such that the power light could be left on to comfort end users that the device is working, but blinking lights could be turned off or dimmed to avoid bothering them. Matthias Machowinski, senior research director for enterprise networks & video at IHS Technology, says he's come across the Wi-Fi access point LED issue in reviewing consumer products for his personal consumption and understands how this could be an issue in certain enterprise environments. "If anything, this illustrates the importance of a good management system where you can make changes easily from a central console." Aruba Networks says it does provide configuration options so that customers can disable LEDs in a centralized way. Indeed, Aruba has customers who want the lights off so that attention isn’t drawn to APs in certain public venues, such as performing arts halls, where the aesthetics would be compromised. Aruba has also seen customers in the hospitality field turn off AP lights in guests’ rooms. So it's not like the latest APs from Cisco, Aruba and others are unsightly. It's just that in some environments, people could do with a little less light.